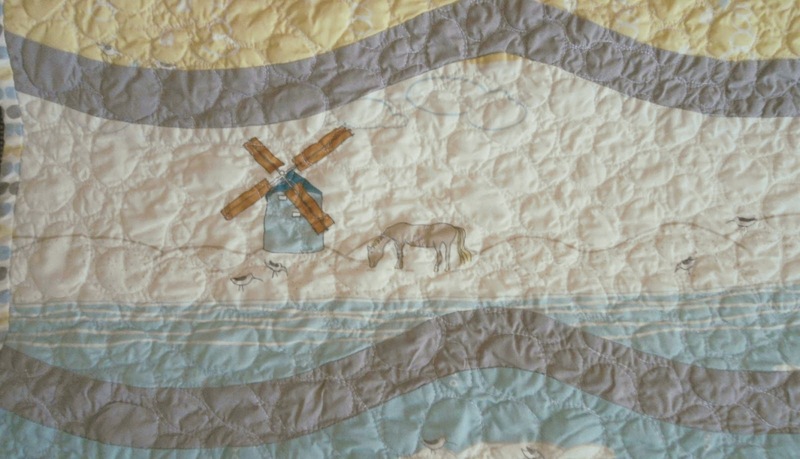 It's that time of the year again, where we get to share our favorite quilts with fellow bloggers, inspire and get inspired. Blogger's Quilt Festival has started!!woot!!woot! !Thanks Amy, for hosting this amazing Festival again!!!. 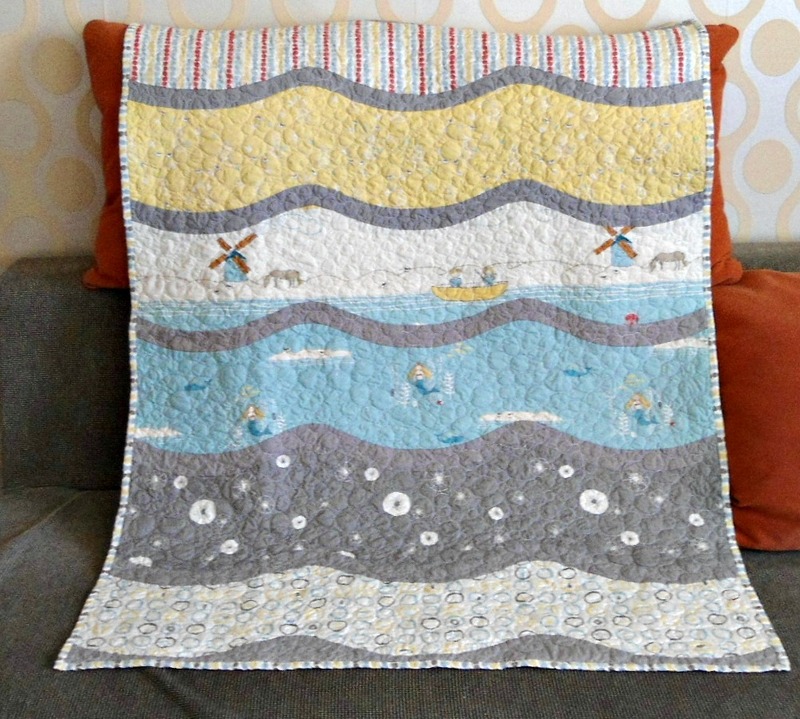 So, I'm entering this year with my latest quilt "by sea or by Land", a quilt pattern chosen by my mother to be given as gift to my newborn lovely niece. I can't stress enough, how difficult this quilt was, even before starting working on it. My mother is a visyal-type, which means that she wants to make something as she sees it. So, when she saw for the first time the By Sea or By Land Quilt Pattern by Lunden Designs she fell in love with it. Our arguments were monumental about how the grey sashing would not be appropriate for a baby girl (my point of view). (I so wish that everyone would have to argue about "so important" stuff:D). So, since she insisted so much on the grey sashing, I went and bought white sashing (typical me!!). I didn't tell her though, I waited for the fabrics to arrive, and then reveal my big secret. We ordered 7 different prints from the amazing fabric line "Storyboek II" by Jay-Cyn Designs, for the front side and binding, and for the back side we chose to go with piecing (at least I convinced her on that! !--which was new to me also). So, for the backside we chose Pure Organic Solids Prepared for Dye by Robert Kaufmann and 1/2'' yard of Patchwork from Storyboek II. It was gonna look amazing! When the fabrics arrived, she came over to see them. My secret was revealed! !She was so furious with my white-sashing decision, the same evening I ordered Mod Solids Shroom for the sashing and waited again for the new fabric to arrive. Anyway, I love this quilt pattern, cause it involves curve piecing. It was something completely new and intimidating to me. Now, after this quilt, I can't tell you that I'm hooked on curve piecing, but I do feel more confident. But I can tell you this!! I've missed/misplaced almost 200 pins! 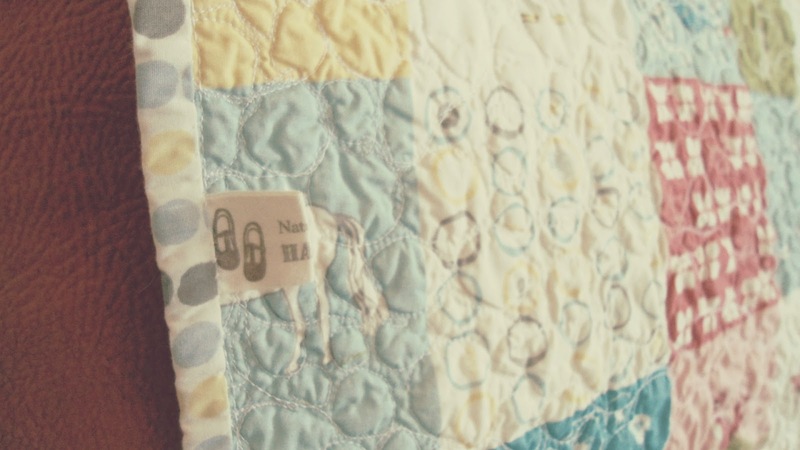 After this quilt, they've magically disappeared :D Should I think of quilt heaven? I don't know. Another reason why I love this quilt, is because it shouts out for pebble quilting. I've loved this quilt method a long time now, but never tried it before. And when I saw this pattern, I thought that it would look really nice. I didn't know though how time and thread consuming it is. After I think it was 10 bobbins and almost 6 hours of quilting, I knew. I knew that this gift would be priceless. 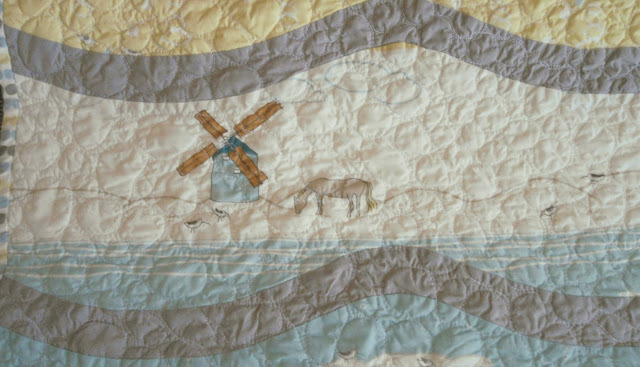 This little quilt would be treasured for life. And when we gave it to my cousin, I was so happy when I saw the reaction on their faces when seeing it. I remember my cousin asking me, hey Eleni, you didn't do all those circles right? And I was like! dahh!! first of all they're not circles, they are pebbles and yes! I DID them! Finished quilt measures : app.38 1/2" x 52 1/2"
Now, do head over and check all those beautiful quilts made by fellow bloggers out. Thank you for stopping by!! Great curved piecing, it's a very sweet quilt. Love the quilt and am seriously impressed with your pebbles - can't believe it is your first time, my first attempt at pebbles was a disaster! This is beautiful! Such a sweet gift for your niece! 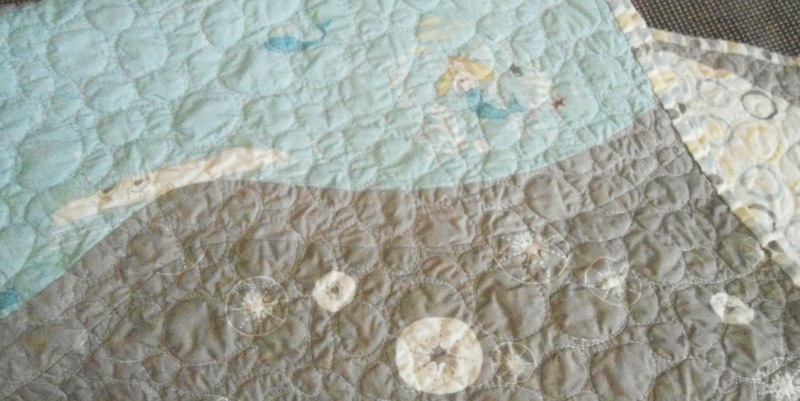 Love the quilting too! How darling! I love all the quilting. I know how long that takes. This is lovely, the curves and different fabrics make it very interesting. 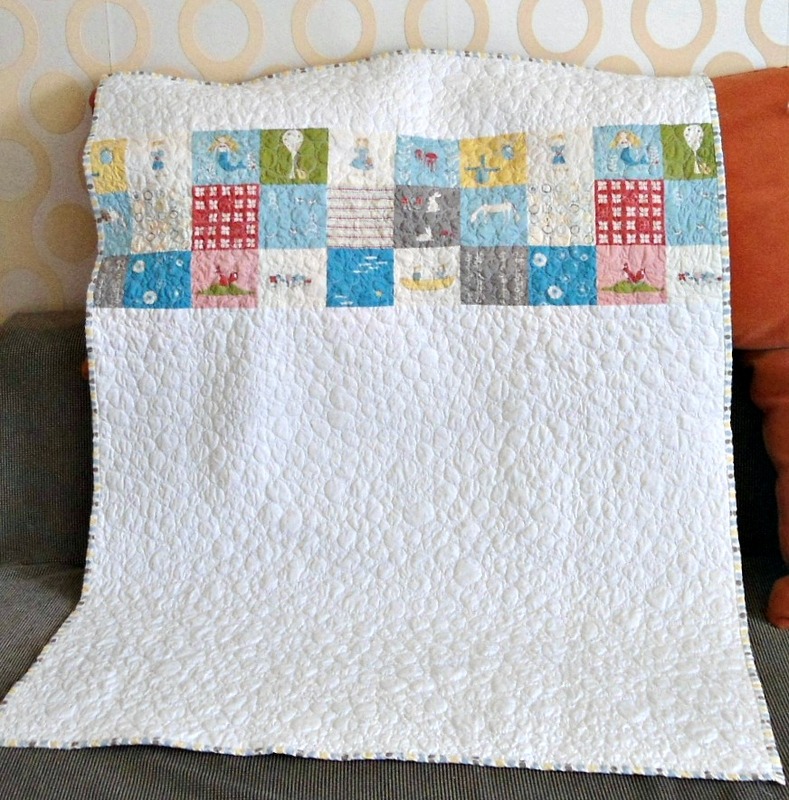 A lovely baby quilt - I have to agree with the use of the grey. Your quilting is great too. Oh my goodness, beautiful! 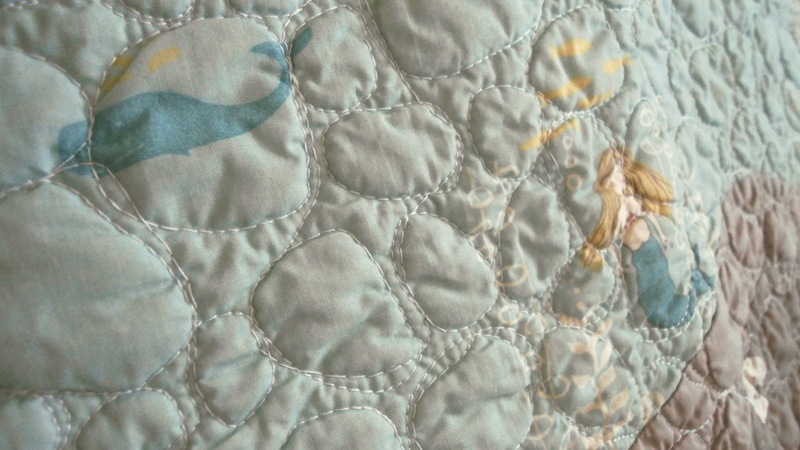 This patters is great and it does call for pebble quilting. Love it, got my vote. It looks so cute and cuddly quilted in pebbles. And I might agree with your mum about the grey ;) it looks really good with these fabrics.